Work for DialersPro Predictive Dialer? Learning about DialersPro Predictive Dialer? 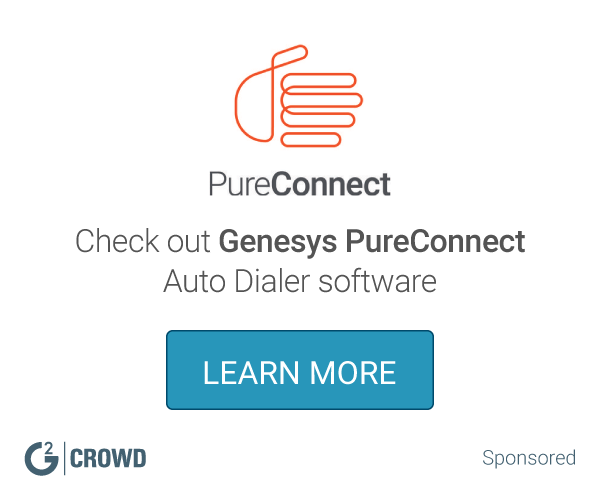 What Auto Dialer solution do you use? Velocify Lead Manager is a solution that helps you manage and respond to leads by capturing and automatically de-duping, and distributing inquiries coming from a variety of sources. Five9 is the leading global provider of on-demand call center software for telesales, telemarketing, customer service, help desks and order processing. We built sales professionals a better dialing system. RingCentral Contact Center is an omnichannel solution designed to let customers choose their preferred method of communicating with a company, including voice, chat, social media, SMS, email, and others. Voiptime Clould is an innovative cloud solution for sales by phone. The smart and intuitive Lead Management System helps to store all your contacts in one place and manage them easily. XenCALL is a software solution for professional sales whether residential or B2B, and includes call center management tools, predictive caller, auto dialer, AI dialing, calender integration, and call provisioning,. Ytel delivers SAAS OnDemand productivity and communications solutions delivering call recording and predictive dialing solutions. TP Smart Dialer is one of the most innovative Softphones in the VoIP Industry that empowers VoIP service providers to run their services across all networks. * We monitor all DialersPro Predictive Dialer reviews to prevent fraudulent reviews and keep review quality high. We do not post reviews by company employees or direct competitors. Validated reviews require the user to submit a screenshot of the product containing their user ID, in order to verify a user is an actual user of the product. Hi there! Are you looking to implement a solution like DialersPro Predictive Dialer?